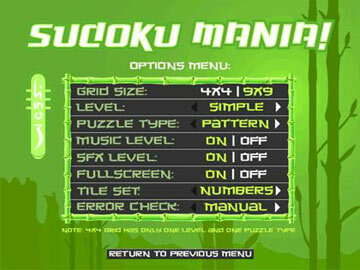 Home | Download Games | Sudoku Mania! 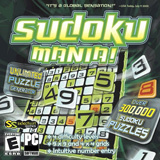 The hottest craze to sweep the globe -- Sudoku Mania! Download Edition! This is the incredibly addicting numbers puzzle game you've heard all about! Although number puzzles have been around for years, Sudoku has spread from Japan to the U.K. and U.S. and all across the world and the game has never been the same since! Everyone is hooked! A game of logic and reasoning with no math skills required. Simple to learn, yet a lifetime to master! New to Sudoku? This game makes it easy for you to learn to play with hints, cheats, and more! This game comes with 130,000+ puzzles in four skill levels. Still not enough? This game can auto-generate new puzzles on the fly. 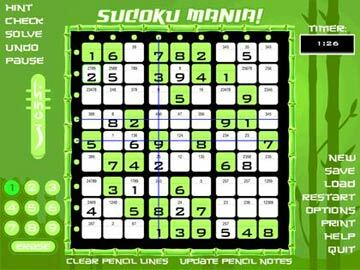 Generate unlimited Sudoku puzzles for your endless enjoyment! Includes all the tools and features to make Sudoku gameplay MORE fun than the original written crosswords! 2 Ways to Play! 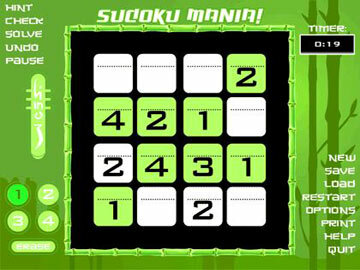 Choose from 9 x 9 or 4 x 4 grids to play Sudoku! Quick & Direct Number Entry! Easy-to-use tool to enter numbers directly into the squares or by mouse clicking. Very quick and intuitive! Pencil Notes: Easily enter Pencil Notes, a popular note-taking method for solving the puzzle! Pencil Line Tool: Simulates how you would 'pencil line' numbers by activating horizontal and vertical lines on screen. Erase all lines with a simple click! Hints: Stuck? Get hints for both Numbers and Pencil Notes! Timer: Race against the clock to complete your puzzle! Print Puzzles: Print Sudoku Puzzles to take with you to go!